SEATTLE, WA: Big Trees Inc, (http://bigtreesupply.com/), a tree transplantating and tree nursery company in the Seattle area, recently began a large-scale tree transplantating project to the San Juan Islands. The project consists of transplanting a number of large Cedar trees to the site as well as smaller plants to accent the landscape, and will include furnishing the plants with irrigation upon arrival. The project will involve a larger crew than normal to handle the large quantity of trees called for, as well as the harbor-to-harbor transition. The project involves moving 17 Excelsa Cedars, each varying from 12’ to 18’ tall. Additionally some smaller plants will be transported to accent the new planting beds. The crew will take the landscape trees by ferry to Friday Harbor and then to the site from there. The project is for a client living in the islands and will be done to create privacy screening to the property as well as enhancing the aesthetic value of the landscape. 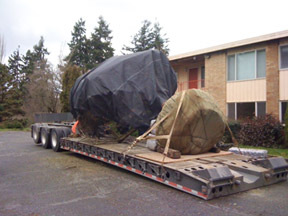 The site is a long distance from the company’s principal nursery in Snohomish, WA, but the crew will be working in a timely fashion to ensure all of the trees arrive safely and planted properly.